If you haven’t created a One Degree account yet, go here. In your account "Settings", make sure you are using your work email address, and that you check off that you work at a nonprofit or government agency. This will give you access to Professional Member features, such as "Referrals". If you don’t have a work email address, please email data@1degree.org and we can figure out the best way to connect you with your organization. 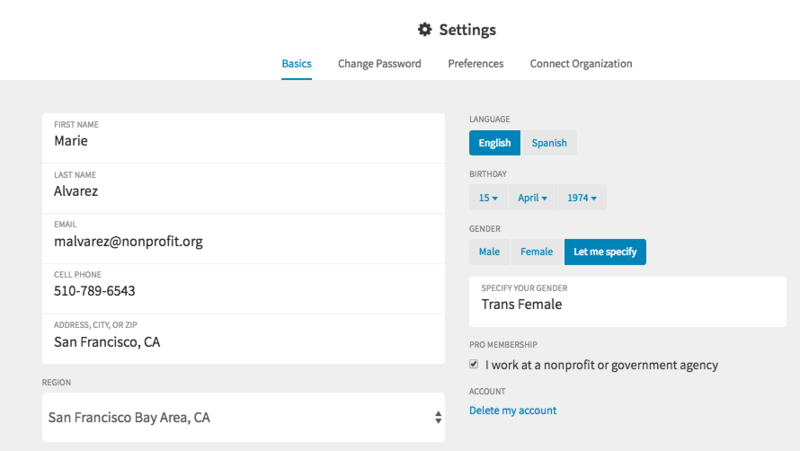 Select the “Connect Organization” tab and start typing your organization name in the “Organization” field and select your organization from the drop-down menu. Add your title in the “Position” field. Click the “Connect” button. Your request will be sent to either the One Degree team or a member of your organization. Please give our team 1 business day to approve your connection. You’re all set up with your affiliated, Pro-member One Degree account. Great job! If your organization doesn’t show up in the search box, it means it is not yet listed on One Degree. To add it, log in to your One Degree account and use this link to add your organization to One Degree.